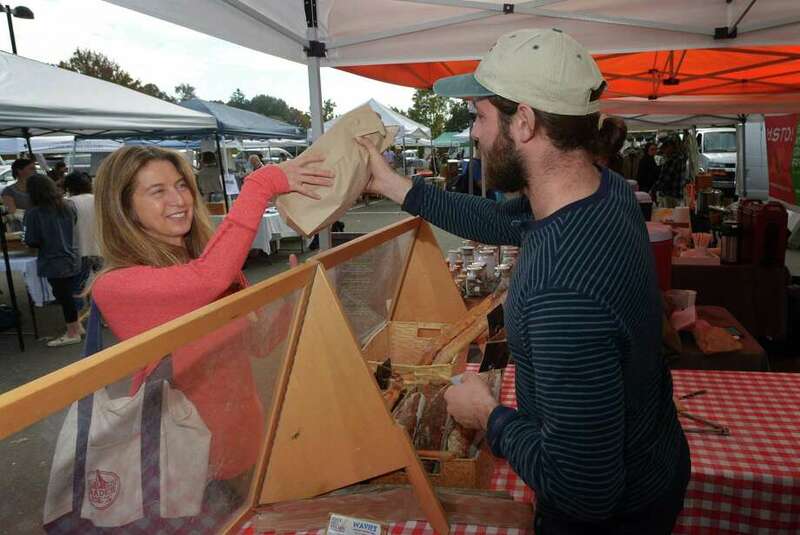 Cheryl Hiden of Weston buys a loaf of bbread from Jordan Filipowich of Wave Hill Breads during the second to last installment of the Westport Farmer's Market for the season Thursday, November 1, 2018, in Westport, Conn. The last day was Nov. 8. Supper & Soul, dinner and concert series will return on Nov. 10 with some southern flavor, according to the Westport Weston Chamber of Commerce. The single ticket multifaceted event allows participants to enjoy a three-course meal at one of seven downtown restaurants, then see a concert at the Seabury Center and return to any of the same restaurants for happy hour pricing for drinks. The ticket for this event costs $75 per person. This concert will feature Kasey Tyndall, who Rolling Stone magazine listed as the No. 1 new country act to see in 2017. Since that time, Tyndall has played more than 100 shows all over the country. The restaurants participating in this collaboration now expands to seven and includes: 190 Main, Amis, Rothbard, Spotted Horse, Tavern on Main, Jesup Hall and Matsu Sushi, each within two blocks of the Seabury Center on Church Lane. The dinner seating will take place at 6 p.m., with the concert beginning at 8 p.m. Tickets are first bought online through the Chamber, then reservations are made on a first-come, first-served basis once again through the Chamber. Drinks and tips are not included in the price of the ticket. For information and to purchase tickets, visit www.westportwestonchamber.com/supper. Highly acclaimed singer/songwriter Joe Jencks will be performing at Voices Cafe on Nov. 17 at 8 p.m. with guest Heather Pierson. Jencks is an 18-year veteran of the international folk circuit, an award-winning songwriter, and celebrated vocalist based in Chicago. Having penned several No. 1 folksongs including “Lady of The Harbor,” Jencks is also co-founder of the harmony trio, Brother Sun. Jencks is noted for his unique merging of musical beauty, social consciousness, and spiritual exploration. Pierson is an award-winning multi-instrumentalist, singer/songwriter, and performer. From New Orleans-style jazz and blues to rousing Americana and poignant folk narratives, Pierson’s record releases and live performances, both solo and with her nationally touring acoustic trio, reflect her creativity. Her trio’s latest CD, “Singin,’ ” debuted at No. 1 on the Folk Radio charts. Voices Cafe is located at The Unitarian Church in Westport, 10 Lyons Plains Road. Doors open at 7:30 p.m. Tickets are $30; children 12 and under free. For information call 203-227-7205, ext. 14, or visit www.VoicesCafe.org. A Stratford- and Westport-based attorney has been named one of the top attorneys in the state. Margaret Sheahan, co-founding principal of the employment law offices of Mitchell & Sheahan, P.C., has been selected for inclusion in the Top 25 Women Super Lawyers in the state for 2018 by Super Lawyer, a designation of top-rated practicing attorneys selected through extensive evaluation. Sheahan was awarded this distinction from 2006 to 2018. A graduate of the New York University School of Law, Sheahan is a member of the American, Connecticut, Greater Bridgeport and Fairfield County Bar Associations. She serves as the Labor & Employment Law subject editor of the Connecticut Bar Journal and on the CBA Labor and Employment Section’s Executive Committee. Mitchell & Sheahan, which concentrates on employment law and labor relations as well as litigation and trial practice, does business in Westport’s Colonial Green on Post Road East, in addition to its original headquarters in Stratford. It helps both employers and employees with issues such as severance, non-compete, discrimination, sexual harassment, compensation issues, family leave matters, and more. The Westport Historical Society will host a presentation titled “The Great Migration of African Americans to Connecticut in the 20th Century,” on Nov. 15 from 6 to 7 p.m.
Stacey Close, of Eastern Connecticut State University, will discuss the topic as it relates to the state of Connecticut and Fairfield County in particular. Close currently serves as the associate vice president for equity and diversity at Eastern Connecticut State University in Willimantic. Close has taught courses and frequently lectures on African-American, American, African, and Southern history. Westport Historical Society is located at 25 Avery Place. Online registration costs $8 for members and $12 for nonmembers. At the door, $10 suggested admission for members, $15 for nonmembers. No charge for children 12 and under; $5 for students with ID. Reservations are recommended at westporthistory.org or call 203-222-1424, ext. 5.